Reader Question: Okay, so maybe you've already answered this but I haven't been reading your blog for long or been planning my wedding for long either, but I've begun to start planning our wedding (even if it is far away) and the thing that I'm worried about getting into the budget is the food. What is the best way to do food for cheap and still have it taste good? Thank you so much for your help! Ah, yes. Catering a big party for your nearest and dearest. I remember the stress. Here's what I don't understand. How is it that Matt and I can go to a restaurant and get two delicious meals for under $30 total and yet $15/person is practically unheard of in the catering world? Yes, I realize that catering usually involves set-up and clean-up and service, but it's food in bulk! It's a few items mass produced! Ugh. Plan to avoid major meal times: This suggestion is the standard recommendation for brides on a budget. There are a couple variations on this theme, including having a brunch wedding or doing something like champagne and cake instead of a full-blown meal. Host a potluck and let your community cater the the meal: I've talked ad nauseum about this option, so I won't say much more. I just couldn't bear to leave it off the list, since it really is a great way to save money (and foster community and connection). Self-cater: Matt and I went this route because we wanted to save money and we wanted to involve our community in the creation of our wedding. Although this route worked nearly perfectly for us, it's not something to be taken lightly. It takes a lot of planning and can create a ton of stress. Partially self-cater: If a handful of your nearest and dearest like to cook, why not tap into their culinary skills for all the sides and hire a catering company to provide the main dishes? Go for novelty: Renting a portable wood burning oven + pizza crew or hiring an entire taco truck might be cheaper options (and will certainly go a long way towards making the day memorable). Stray far, far away from the beaten path: It's hard to find a good deal on the well-worn wedding path (thanks, Wedding Industrial Complex). However, there are deals waiting to be scored in the dives and family-run businesses of our towns. Think of your favorite restaurant (that doesn't have a pre-printed catering menu) and talk to them about the possibilities. Or what about finding an up-and-coming caterer who is looking to build his/her portfolio? Or what about friends of friends of friend? You can always use craigslist or younger siblings' friends to hire some additional serving/cleaning/setting up help. Just remember, expensive does not necessarily equal good. I have been to plenty of expensive weddings at expensive venues that essentially served conference food. Meh. The moral of the story is: be creative. So often, we get stuck inside the pre-planned wedding formula. We're pressured into conforming to everyone else's vision of what a wedding is. The truth is, the Once-in-a-Lifetime perfect white wedding is really just a societal construct that you can choose to follow, modify, or throw out entirely. Your wedding is your chance for you and your partner to share your lives with your nearest and dearest. If you want to have a Saturday afternoon ceremony, evening reception, white dress, garter, bouquet toss, cake cutting, first dance [insert countless other "essential" details], that's your choice. If you don't want any of it (or want some of it), the choice is also yours. I'm eager to hear your ideas about cheap wedding catering options that still taste scrumptious! Please share! I like Sara's idea about partially self-catering. BBQ or Italian food is easy to do en masse, and then people can bring side dishes. My fiance's aunt just so happens to be a caterer, so she is doing our wedding for $10/person, and we are having a full dinner (fried shrimp, green bean bundles, cornbread ... we're in the South - haha). That still seems expensive to me but my fiance and I are both food lovers so we were willing to sacrifice for that. However, the cake issue is where I am cutting a lot of $$. I didnt want a traditional bride and grooms cake. And I definitely did not want to pay for cake for 300+ guests. Instead I am getting family and friends to make 1-2 cakes each, all of different kinds. Each cake will have a little card in front of it with the person's name and the name of the cake. This is FREE for me, and it adds such a nice personal touch to the wedding. I'm very lucky in that my brother-in-law-to-be is a serious gourmand. He has personal relationships with the chefs of all his favorite restaurants, so when it came time to cater his wedding, he was able to talk the caterers into using his own recipes, and one of his restaurant-owning friends brought lunch for the wedding party. Once Jay and I get to that stage of planning, we hope to "unleash Rus" and let him work his magic on caterers, restaurant owners, or bakeries. Even if we have to stay within a tiny budget, we know that he can find the tastiest food for the best value. I haven't gotten to the catering phase of planning yet, but I'd say ethnic food all the way. Mexican, Indian, Chinese, Thai, etc. Also, if you prefer American stuff then BBQ is another great way to go. Frankly, what I think of as some of the best food in the world tends to be rather inexpensive. Also, if there's a restaurant you like see if they will serve their "lunch" portions rather than "dinner" portions, and then get charged the lunch price. One place I'm thinking of serves the same dish for $12.95 at lunch but $17.95 at dinner. Easy savings right there, especially if they're not catering specialists. Thanks for posting this. I live four hours away from where we are getting married, so I dont know many local cheap ethnic food. All the catering places treat me like an alien when I tell them I dont want to pay more than $15 a meal. Your restaurant reference is exactly what I keep telling myself. Why can I get great cheap meal at an eatery, while caterers expect me to serve crappy, expensive food? So I am thinking of going the Whole Foods catering route, just cake and tapas. We struggled with this as well. I primarily eat vegetarian (only locally sourced meat, and rarely) so that that added another parameter for us to work with. We toyed with the ideas of doing desserts only with late night snacks but didn't want our guests to go hungry either. Some of my family is more traditional, too, and I was afraid they wouldn't stick around long if there wasn't food. We ended up going with a local grilling caterer (burgers and portobello mushroom sandwiches) who will let us buy and use meat from our preferred source if they can't find one we're happy with. One suggestion I have is to really ask for what you want, especially if you're working with a small local business like we are. We even put an ad on Craigslist for volunteer grillers, thinking we would stock salads and condiments ourselves. Once we talked to this caterer, though, it turned out he was interested and excited to do most of it for us because it was something he doesn't usually do. They are also renting plates and silverware to us for 25-50 cents a person, which was WAY cheaper than any other place. In the end I am really happy that I kept asking for things I didn't think were possible, because it turned out they were. I'm in Iowa, so our prices are pretty low for things, but I think our food will be about $8/person. Good luck! we got married at a summer camp - and the camp catered! We gave them recipes, they cooked. It ended up being about $15-$20 a head! "Ethnic" food - think Mexican, Chinese, Middle Eastern - is definitely the way to go. We had a graduation party - not a wedding, but 60++ hungry guests who'd just sat in the sun for an interminable ceremony! - and the Mediterranean platters of falafel, hummous, baba ganoush, grape leaves, pita bread, etc. fed our hungry bunch for around $7/ person. I think drinks and dessert then doubled that cost. When we were thinking about a caterer we went straight to the place that we love to grab lunch - the deli around the corner from our school. The guys who own it are friendly, they always remember our name, and their sandwiches are imaginative and tasty so we asked them if they would roast a whole pig for our wedding. We figured we had nothing to lose. Turns out they had just bought a pig roaster! I thought they might laugh at our modest budget for 110 people but they were more that accommodating and are even going to purchase kegs for us at cost and throw in bio-degradable sugar cane cups for free! Moral of the story - don't overlook what's right in front of you. I'd suggest going to a restaurant that you would consider a date place that is a bit too expensive for everyday ($15-25 a head) and ask them about private parties. We had our engagement party at a really nice local restaurant for 40 people for $30 a head with no site fee and including 2 drinks. The reason why restaurants cost less than catering is that restaurants order different amounts of different ingredients and don't have to order all the food for a specific event special. You'll notice that on a restaurant menu there will be several dishes that contain shrimp. There will be a shrimp appetizer, a salad, several entrees. If you want to have a shrimp hors d'ouvre at your wedding your caterer is ordering it just for that one thing. We chose the alternative time route to save money. My first idea was a morning wedding and serving pancakes (something we loved making together and serving to others), but because of the way our schedules and honeymoon fell, we ended up with a friday evening wedding. We scheduled it for a bit later and just had a dessert buffet. There was no wedding cake, just really delicious desserts. It was in December so we also had a wide variety of hot drinks available (along with water and iced tea). My husband had worked for a caterer in high school and is quite leery of what goes on behind the scenes. WIth this in mind, dessert seemed a much safer option (plus, we had a trusted friend who was just starting her catering business). we are doing a laid back BBQ type of wedding. we're going to roast a hog!! we haven't quite figured out all the details, but that's the plan as of now. we're also having our families (his mom has 5 sisters and my step-mom has 4 sisters) do all the side dishes and the cake. We did a dessert reception too. The ceremony started at 8 pm and our "dessert soirée" followed. It was a buffet of dessert options like cupcakes, cheese cakes, maple cake, cookies, maple tofu dessert squares, gummy bears, etc, plus Brie and baguettes, fruit, and almonds. Worked great for us. :) We self-catered and it WAS a challenge, but we were glad to save money by doing it. And have yummy desserts. And both the gummy bears and cupcakes were a hit. what about having a bbq and pot luck combo? I think that would be tasty and cheap. We were eating at our favorite Lebanese restaurant one day and realized that they did platters for $10/person. It wasn't full catering, they didn't provide plates or serving or anything, but they dropped off delicious food and we set it up and ate it buffet style, and it worked out great! For our rehearsal dinner my fiance and I are hosting a baseball inspired BBQ (we're thinking hot dogs, a nacho bar, peanuts) at my aunt's house. We met sleeping out for world series tickets in 2004 and I had to had the Cardinals somehow be involved. To boot we'll be able to enjoy the baseball game that evening with our bridal party and family as they'll be playing at home that night. I'm so super excited and can't wait! Something I'm sure someone has mentioned is calling up a culinary school or college with a culinary program. My husband's friend catered our wedding for cost because he needed to fulfill a catering requirement for school. It was awesome having a friend cook and he had access to some great resources through the school. This saved us money and allowed us to help a friend. In your post you mentioned having the reception avoiding major meal times. We did this and it cost less than a third per head!! Look into renting a venue and using the contracted catering at your Alma Mater/current school. We are renting a very nice banquet hall on campus, with set-up, breakdown, servers, bartender, linen, china, and food for 225 people for $2,391. They aren't as worried about making sales goals or surviving. To them, it's another university event to be catered almost at cost. I got suuuuper lucky in that my Dad has been bartender for over 20 years and knows a TON of people so he found out about a little "gem" as they call it, which came in the form of my caterer. So, the moral of this story, check out the small towns around you! If you're going for a more upscale catering service, then this isn't probably what you're looking for, but if you're looking for BUDGET friendly food that tasted GOOD (you know those grocery store delis can have some awesome food), then check out some smaller grocery stores with delis and see what kind of catering packages they can work up for you!! I've been reading your blog every week since getting engaged... Thank you for the GREAT advice. 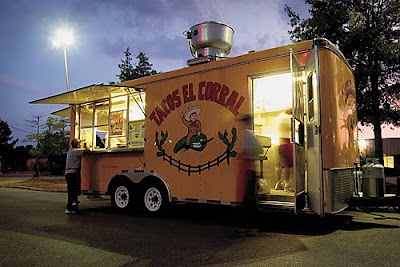 We are SO excited to have a taco truck rolling up to our backyard wedding. It's gonna be a great surprise for our guests. I found a restaurant that caters on a budget. The restaurant doesn't charge per person. Instead, you purchase by the platter. So my fiance and I will be saving so much money if we go this route. I see this post is older, but where in Iowa was this? It sounds perfect for our wedding! I'm in the Des Moines area. Thank you!